For those still wondering whether Android's first Ice Cream Sandwich device will be made by Samsung, there may finally be a definitive answer. 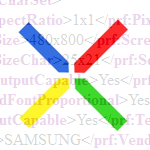 A file recently spotted on Sammy's website called "nexusprime.xml" tells us that the answer is yes. The XML file contains the User Agent Profile for what we are assuming is the Nexus Prime, but there are a few shocking revelations buried within. The first thing that stands out is the screen resolution, which is listed as 480x800. 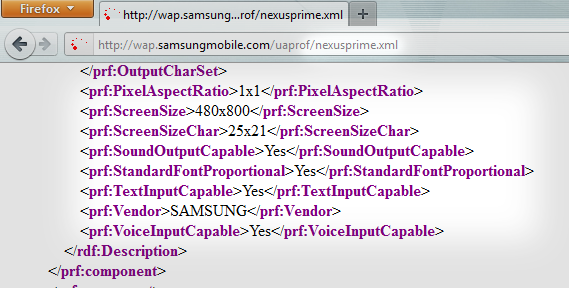 This goes against just about every Nexus Prime rumor we've seen that have indicated a 720p resolution. Additionally, the file lists an ARM11 processor, and the model number GT-I9250 - a number that we've seen before. This Is My Next speculates that this could point to a dual release, where the SCH-i515 will be the Droid Prime for Verizon, and the phone revealed in the XML file will be the Nexus Prime for other carriers. Personally, I'm taking this file's claims with a grain of salt, as it is highly probable that they are either not final, or accidental. Either way, we'll be here with more details if and when they become available.